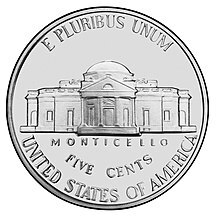 This article is about the United States coin. For the metal, see nickel. A nickel is a coin. It is in the United States currency. It is worth 5 cents. It is made of cupronickel, an alloy of copper and nickel. This page was last changed on 10 January 2019, at 15:25.